So do you remember that time I said I will be more involved with my blog and writing this year? Well, here is the official first step toward that. Last week I did a fabulous Book Spotlight on Jessie Harrell’s book Destined (CONTEST HERE) which included a special interview and a sneak peak. 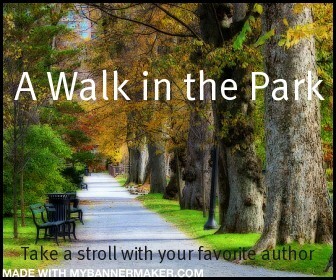 Today I am introducing a new “segment” into my blogging life called “A Walk in the Park.” (Because sometimes we all just need to take a nice walk in the park, preferably holding a nice cup of coffee) This will be dedicated specifically to getting to know your favorite authors. I will still be posting reviews, but I also want to give you, my dear readers, a chance to get to know these lovely ladies and gentlemen for yourself. So without farther a due, welcome our first official guest Jodi Meadows! Welcome Jodi! Thanks for taking the time to visit. Incarnate is a wonderful story (REVIEW HERE). What was your favorite part of writing it? I’m so glad you enjoyed it! I actually love the whole process of writing, from planning to plotting to drafting and all through rewrites and revisions. I even love copyedits. I’m aware this makes me a freak among writers. But the discovery part is probably the most exciting. Even when I have the story in my head, I don’t always know what turns it might take. How long did it take you to write Incarnate? I wrote a note to myself with the premise in July 2006. I started planning and world building in October 2009, then started writing the first draft a month later. The first draft took just under two months, with another month or so for revisions. Do you believe in reincarnation? If so, what past life you think you’ve lived? Range — where INCARNATE takes place — is a fictional world with fictional reincarnation. As for real-world reincarnation? It’s not one of my personal beliefs, but that certainly doesn’t take away from my fascination with the idea. Ana is a very interesting character. I loved watching her grow. What was your favorite part bout writing her? Like you, I loved watching her grow. Ana is a character with a lot of potential. Because she starts so low, she has all the room in the world to grow and change. Now let’s talk about Sam. Oh Sam (slight fan girl moment) he is such an old soul. Ha, no pun intended. Where did you get the inspiration for him and all his awesomeness? My characters tend to fall into my head fully formed, and Sam was no exception. I knew that in order to be the perfect partner for Ana, he needed to be patient, open-minded, and did I mention patient? I also knew I wanted Sam and Ana to have more to connect with than their mutual good looks. They had to be friends, first, and friends tend to get that way by having things in common — like music. What can you tell your readers about Incarnate 2? Not much right now, I’m afraid. But here are some hints: there will be more music, more sylph, and we’ll be digging deeper into the world building to start uncovering mysteries. What’s one thing that you wish you knew/were told before you started writing? Nothing. I’m afraid if I knew anything ahead of time, it would change my journey to publication. And as hard as that was, it was well worth the effort; I wouldn’t change a thing. Both. Coffee in the morning. Tea the rest of the day. That depends what I’m in the mood for, but I’ve always had a special love for classical music, which is why I chose it for INCARNATE. I try not to feel guilty about anything that brings me joy. I don’t go on vacation much. Mostly I just take naps. Somewhere I won’t a) get sunburned, b) freeze to death, and c) be eaten alive by insects. I hope you guys enjoyed this little feature as much as I did! make sure to check back to see what other guests I’ll have on the blog! Thank you for stopping by my humble little blog and sharing all your wisdom. Incarnate comes out January 31st wherever the books are sold. Get it, read it, love it. Great Interview! Incarnate sounds like such an interesting book and getting some insight into the author has really pushed me to get a copy of this one.